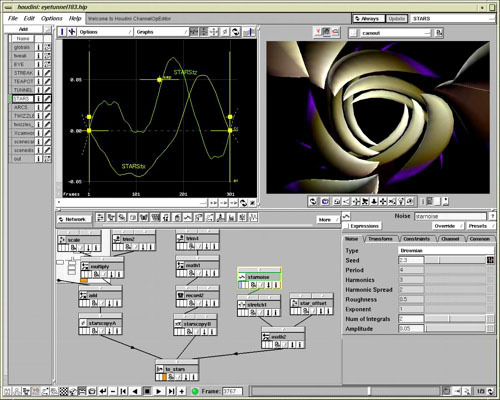 Houdini, which later evolved into Derivative's Touch 101, provided a wide range of techniques that enabled the animators to control visuals in realtime. Here we will explore a few of these tricks to give you an idea of how things are done in Houdini. See where this technology has gone since 1998 - click here or talk to crabman. Here is one of the eight editors within Houdini called the CHOPs Editor. CHOPs (Channel Operators) take numbers coming from inputs like MIDI, combines them, and then sends them to different animation or modelling parameters. For instance, a MIDI slider value comes in, it is scaled to be in the range -10 to 10, and is connected to the horizontal position of a light. Here are 10 basic tricks, plus 3 more that combine the tricks. These techniques and more are demonstrated in a file on the Houdini 3.0 CD-ROM named kabong.tar.gz .